Finally built a trailer I have been wanting to for awhile now. 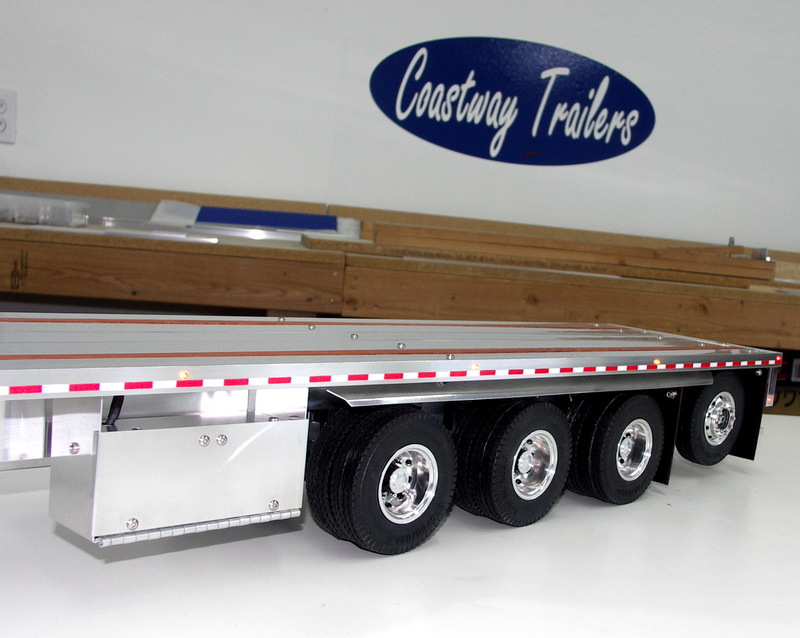 It is a 53ft Quad axle flatbed with a self steering lift axle in the rear. 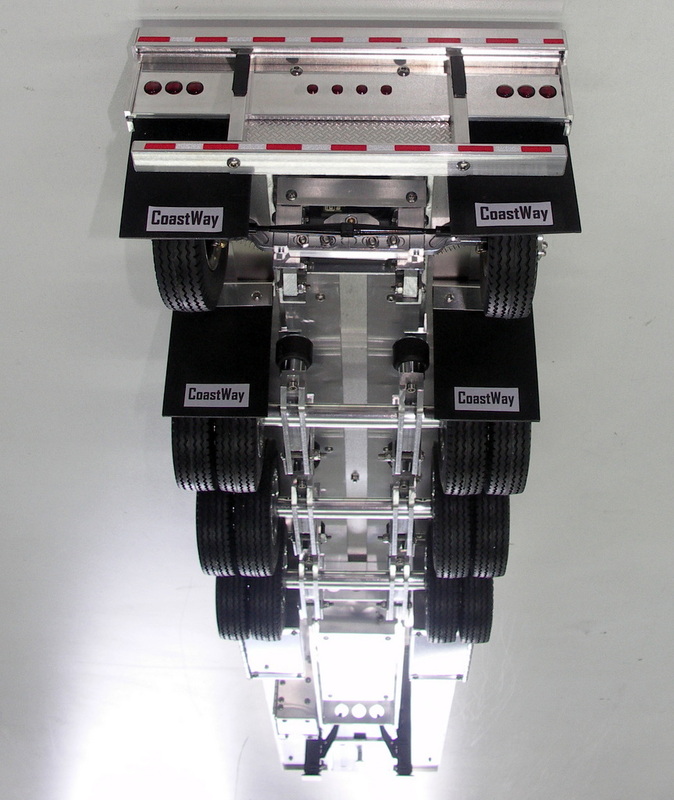 The rear lift axle uses a servo with a control box and switch allowing it to raise and lower without a receiver or radio needed. The on/off switch on the servo battery allows to not drain when in lifted position. The circuit board controls the speed of movement as well as travel limits. 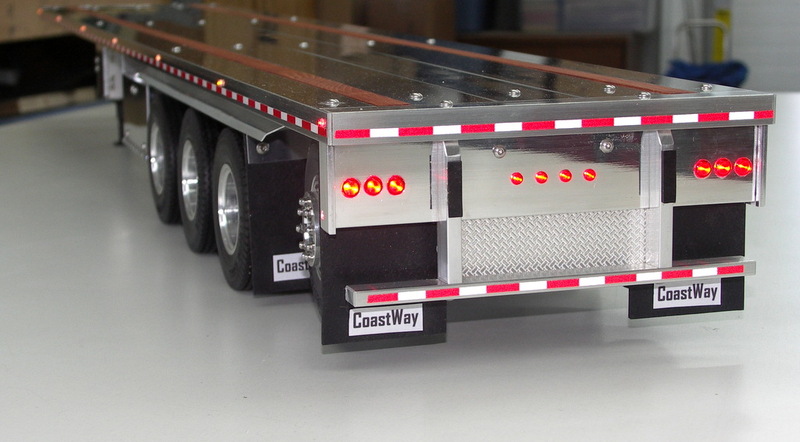 The trailer is also wired so that it can be hooked to the receiver on the truck and the radio can control the lift axle if desired. The retract switch would work great I would think. 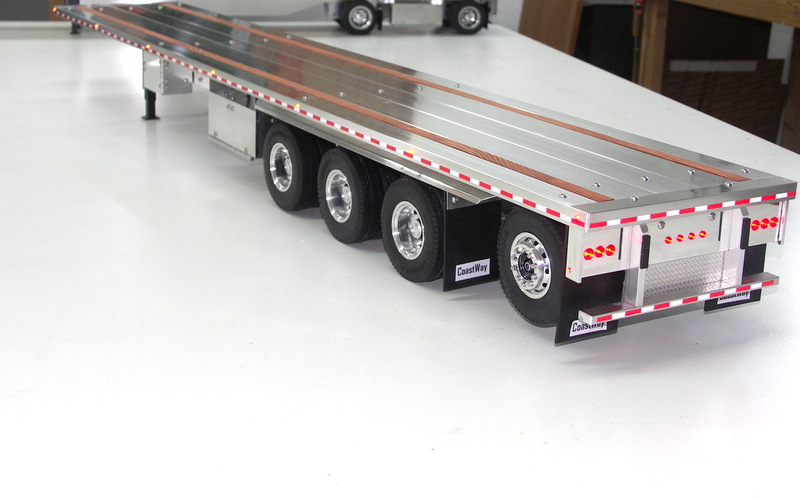 There is a pigtail on the front of the trailer that you can attach a servo wire to and connect to your trucks receiver, when in this configuration the control box and trailer servo battery would not be in use. I will post a video shortly of the rear axle lifting and lowering, it moves in scale speed, the circuit board can adjust speed of lift. The battery and on/off switch for the servo is in the larger toolbox and the switch for raising and lowering the axle is in the front smaller box. Picture above shows both boxes open and the battery and on off switch for the servo. I can’t show too much detail on the lift axle because there is a guy on Ebay selling a knock-off of my suspensions. He or someone else copied them almost to a tee. They were of one of my older designs from 2012-13. I emailed him but he never responded. I am not going to give him a chance to copy and sell my design of the lift axle also. It is 100% my design and would like to keep it that way. It is self steering and self centering, when lifted spring tension keeps the axles straight. 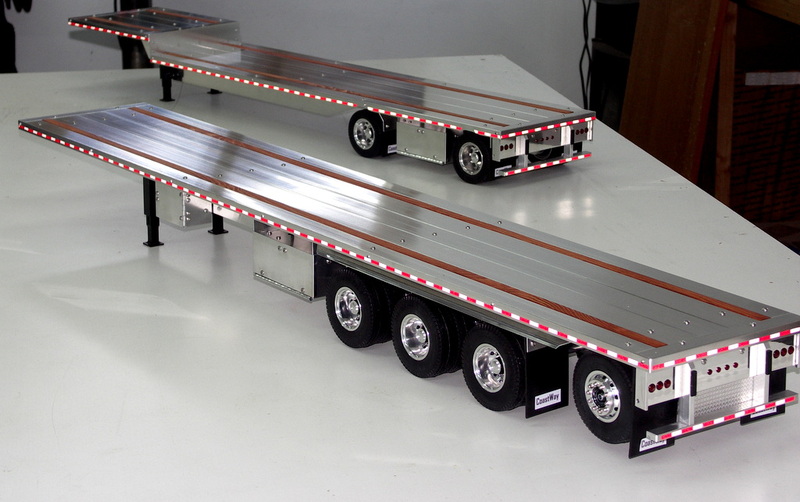 I am interested in the 53-foot Quad Axle flatbed if you could let me know when you produce these again…. Thank you Michael, I will email you. Hi Robert! Thank you for that although I wouldn’t go quite that far calling them works of art, lol! I will send you an email. Thanks! 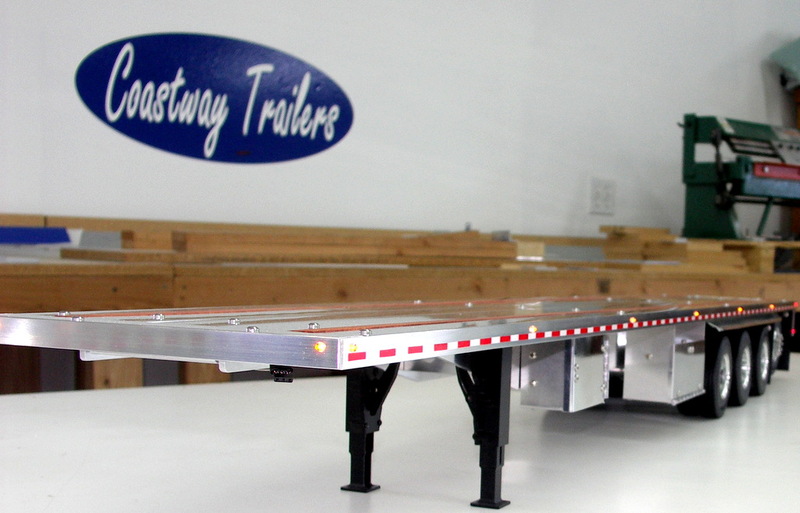 Thanks, wife, for the video of my trailer lift axle! How much shipped to va area code 23112? What else do you have already made and ready to ship and how much? Just completed this 53ft Quad Axle with servo controlled rear self steering lift axle.